"Fredriksen tells this critical history be contrasting the meanings in the sources, particularly in the New Testament, through the story of the money changers, the resurrection, and the End of the Ages." Paula Fredriksen, author of several books on the first Christians, "tells the story of . . . a tale of two cities, Jerusalem and Rome" long before the Jewish rebellion of 68–73 CE. The author uses the first four books of the New Testament and the "seven undisputed letters of Paul" "critically and carefully" with the Jewish War by Josephus "a singular author who serves us an indispensable source" with contemporary non-Christian sources. "Long before Jewish rebels incited the war, Rome had maintained a strong presence in Judea," without which "Jesus of Nazareth would not have died by Crucifixion." That death, however, became "literally only one of thousands [of incidents] that marked the path" to the war of the Jews. The book begins with the political descendants of Alexander the Great's empire "mandating further Hellenization of Judea" that "culminated in the Maccabean Revolt of Hanukkah fame (166 BCE)." Consequently, "Rome became immediately involved in Judea" and "within a century Rome grew into an imperial overlord." The Romans put in Herod the Great as king and through him Jerusalem again became a great city, "the largest and most beautiful city" that Jesus and most of his disciples had or would ever see. Herod, "a master builder, and grand public works were part of the repertoire of power in antiquity," built "one of the most imposing and impressive setting in the ancient world: Jerusalem's temple." Jesus of independent Galilee, Jerusalem in Roman Judea, and this Temple together form the beginning of the story, even with the questions about history between the first three Gospels centered on Galilee and the Gospel of John set in Roman Judea. Paul "mobilizes traditionally pious ideas about Jerusalem's temple when referring to it directly" and "thereby refers to both practice and place." Other Jewish groups such as the priestly Essenes community of the Dead Sea believed "there would come a new temple." "A vivid expectation of the Endtime" evoked "similar beliefs and behaviors" "socially and spiritually" with the first Christians. The latter believed themselves to be "history's last generation." Instead, "in history's eyes . . .they became the first generation of the Church." A series of figures including Jesus and Paul would "view the temple and its operations positively" but also as a metaphor for cleansing the Jewish faith in preparation for the coming war foreseen by the Essenes. Fredriksen tells this critical history by contrasting the meanings in the sources, particularly in the New Testament that survive, through the story of the moneychangers, the resurrection, and the End of the Ages. The bloody incompetence of Herod's son-successor in Judea led to the Roman takeover and eventually the Jewish war. "During these same decades, the Jesus movement vigorously grew, and was surprised—indeed, caught off guard—by its own successes" in a Roman Empire falling into civil wars and unsustainable economic and social injustice. 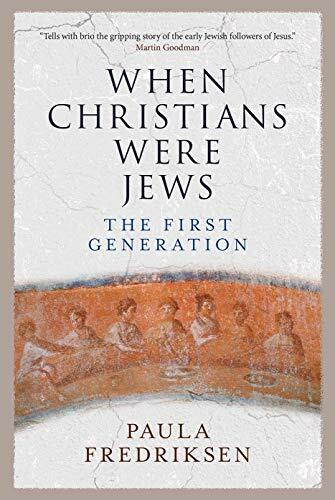 When Christians Were Jews: The First Generation tells its story concisely in easy prose that leaves much for the readers to consider. It has one illustration, a detailed drawing of the Temple of Herod based upon archaeology and historical research, but a useful timeline. It has extensive documentation.